Tried to make toast, yada yada yada, my fire extinguisher works! My rating would have been higher a week ago... and we have owned this toaster oven for at least 7 years, probably more like 10. However, I made toast in it the other day, and started a fire! I understand some of the newer models have safety mechanisms that prevent this, so I will definitely be opting for one of those to replace this one. Other things I dislike: 3 knobs to set to make toast. The door doesn't close all the way (at least, not anymore. I can't remember if it did when we first started using it). No seal on the door. Things I do like: 7+ years with a small kitchen appliance at this price point ain't bad! Temps up to 450, and broil feature: Yes, please! Safety Yes, I am the hazard that created a fire. But the toaster let it happen! Durability 7+ years, 1 fire, and this workhorse is still toasting along Design is it me, or does the door not close all the way? A great size toaster oven! I searched for a replacement toaster oven and I came across this great Oster 6 slice toaster oven on sale. I was pleasantly surprised at how great this one works compared to my older Black & Decker model. It doesn't take up that much more space but it sure does perform like a bigger oven. This model is able to easily fit a small pizza, several bagels and heats up food wonderfully. I find that this model also is alot easier to clean with the removable crumb tray. I have used the convention mode and have baked small amount of cookies very easily. Here in my household we really need a toaster oven. We love how fast it cooks things, and we use it almost daily, for toasts, Pop Tarts, bread, leftover pizza... so, when we moved we wanted to buy a really good toaster oven, and Oster was always a brand we trusted. So we chose this model, mainly because of its size: you can bake a whole 12 inches pizza on it, and it has a "pizza mode" that really bakes the pizza really good, with crispy crust and melted cheese. 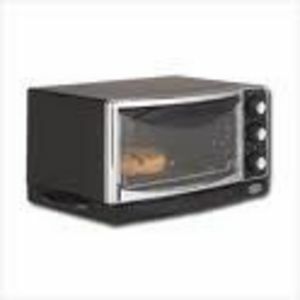 The main thing of toaster ovens is that they preheat way faster than regular ovens, wich saves time and money. So being able to bake pizza in a toaster oven is great. Another awesome thing about this model is that it is also a convection oven. So, when you need to reheat something, that is the best function. Since we don't cook much meat in our house, I never did anything like meat or chicken using this function, but it works for burgers and similar. It's fast and cooks evenly. This toaster oven don't have digital controllers. It's the good old knob system. It has three knobs: temperature (up to 450 f), mode (broil, warm, toast, pizza, convection oven) and the timer, that goes up to 60 minutes, then shuts off by itself. The broil also works fine. It has one shelf, and a easily removable crumb tray. The only problem is, since you can pull the crumb tray from the front, some crumbs always get stuck in the oven door, and it's hard to remove them, so sometimes I'll just flip the whole oven and shake them off. Another problem is the door, behing the handle you use to open it there's a metal surface that gets really, really hot. So I've burned my fingers accidentally there, when going for the handle to open the door. Overall we love this product and wouldn't change it so far. Safety There is a metal area on the glass door (right behind the handle) that sometimes overheat and you can burn your hands when opening the door. Ease of Cleaning You can't open the machine from behind, and the coils make it hard to clean the bottom of the stove. My husband bought me this toaster oven for Christmas last year and I have fallen in love with it. We had a regular two slice toaster oven that I loved but it died right before Christmas and since we have two children, we decided that we needed to upgrade. I probably use this toaster oven 3-4 times a week now and it's so easy to use. I love the fact that I can do pretty much anything in it that I typically do in the oven without heating up the entire house! I can't wait until summer when I can cook without making the house hotter!! We mainly use it for breakfast (toast and bagels) but it's such a help when it's lunchtime and the kids are super hungry. I can just throw in two pieces of toast with a piece of cheese in the middle and you have a grilled cheese in a matter of minutes! Beware, it does get really hot though...I have already burned myself. Would definitely recommend! I've owned 3 or 4 toaster ovens. My family loves them! It's so nice to be able to do cheese toast or pizza or even reheat leftovers without cranking up the big oven. (We don't use a microwave.) Anyway, we use the toaster oven at least once a day. We bought this one about eight months ago and haven't had a single problem with it. We love the black and silver...matches our kitchen appliances, and it fits perfectly in an out-of-the-way corner. The tray in the bottom is easy to pull out and clean...it's not even black yet...when I scrub it, it still looks brand new, unlike some of the other toaster ovens we've owned. My only negative about this unit is the bell...when your toast is ready, the whole house knows about it. Wish I could turn down the volume on the "ding." A must have in appliances. I grew up without knowing a toaster oven existed! When I was introduced to this item, I knew I had to have one. I purchased this wtih it's matching Microwave and have used it so much that I'm surprised it hasn't died on me. I use it for toast, buns, broiling and even for pies! There was also a period of two weeks when my oven wasn't working so I relied on this little guy to take care of all the baking needs. The price is fair, the product looks great, takes up not much room and can do the work of a regular sized oven. There are many pros with this item but there are also some cons. I know most only come with one small cookie sheet pan, it would be nice if these accessories were readily available. This is also not an easy clean item on the inside. I have some stains that I can't seem to clean making it not look so great on the inside. There have been some uneven cooking moments, especially with toast, it somtime tends to cook crispier towards the back sometimes burning the edges. This wonderful toaster oven was one of my wedding gifts in 2007. We use it almost every day! There is just my husband and I in our house right now, so when we want to cook up some chicken fingers or a small casserole, this oven is perfect to use. It uses less electricity than the large oven and doesn't heat the house. I love how spacious it is inside the oven. I have no trouble fitting glass baking dishes in it, several pieces of bread or chicken. I really like the cooking options - there is a wide range of heating methods and temperatures. You can also set the cook timer. The only down side is that at times I notice some uneven cooking, but this is only noticable on pieces of bread or meat. I just know to check it mid-way through the cook time and move things around if need be. It is definitely worth the purchase! Of all the great inventions of the twentieth century, the toaster oven has to be near the top, at least for kitchen appliances. Having used many a toaster oven, I've got to say the most important factors to judge them on are toasting quality, size and reliability. As I think plagues many toaster ovens, the toasting quality is mediocre. Yes, it will toast break and multiple slices, but does not have the same even toasting you might get from a conventional vertical toaster. I think it's because of the uneven distribution of heating elements on the top and bottom. Size wise this is classified as a six slice toaster, but they would have to very small slices. You'll be able to toast 4 slices comfortably. Reliability? Mine broke. The thermstat no longer works, so I can only toast. Overall, this is a fine toaster, but since it broke, I can't rate it any higher. Oster 6-Slice Toaster Oven is a handy kitchen appliance. This 6 slice toaster is a replacement for a smaller one, and I do really like that I can cook up to 3 English Muffins at once, that a small casserole dish will fit inside, and that the crumb tray is easy to remove. However, I do not like the size of this unit - it is not only too tall, it is very deep. I like the ability to control the temperature and whether all the coils are heating or not, but it takes too long to toast. I love my toaster oven. Until last year I never owned one. It is the best investment I have ever made in a kitchen appliance. It helps me so much to prepare hot snacks, breakfasts and lunches for my children. I not only use it to make toast, but I make toasted sandwiches, tuna melts, mini-pizzas using flatbreads as a base, and heat frozen appetizers. I have even used it to bake a small pumpkin cake. It is great not to have to turn on my large oven for a few small items that need to be heated. This greatly helps us to save energy. I love the adjustable tray in my Oster toaster oven and the removable drip pan for ease of cleaning. The outside of the unit does get hot when in use. I have placed mine on my countertop where my younger children cannot reach it to avoid any potential burns. I like the fact that I can toast six slices of bread at one time. This is a great help when you have four hungry little people waiting on toast first thing in the morning.